Hey I am creating a device that will be attached to regular Drum Kit. The setup is quite simple piezos with 1M resistors are plugged into 8051 and from arduino i read each value from the analog input. Everything is kind of straight forward cause I can read from the piezos values, but what I have noticed is that when i hit one piezo, the readings in other inputs are affected as well, and the values are high enough so I cannot from code really say which one was hitted (because I don't really care about what the values exactly are, just one hit). For me it seems that all the line of piezo's connected together affect the rest of the inputs somehow. I guess I screwed up something with the piezo connection. Thanks for any kind of hints! 1) yeah thats true, i meant 4051! 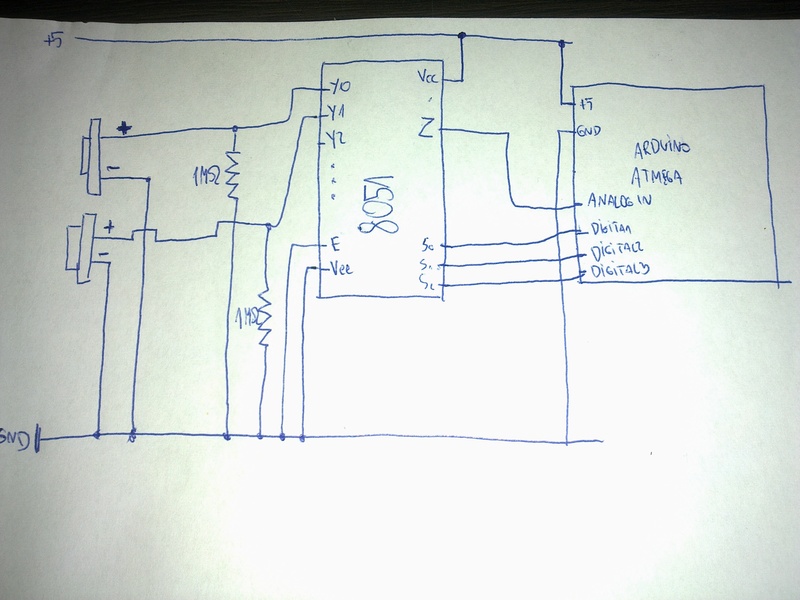 i have this mega version of arduino, and i plugged all of them in, and had the same results like i said, i could recive the signal, but it was affecting all the rest of the analog inputs, this is why i considered using 4051 because I was expecting it to have some built in stabilization etc things inside.